Home ﹥ FAQs	> FAQ - Camera DCC Filter > ☉ How to take Visual Color photo with the Filter? ☉ How to take Visual Color photo with the Filter? ☉ How to use “RAYNAULD™ Directivity Color Calibration Filter” with camera to obtain the photo of “Visual Color”? The camera manual white balance compensation systems of all brands of cameras/CAM are different from each other. In addition, the multiple lens refraction and their surface coating create varieties towards the color temperature through them. 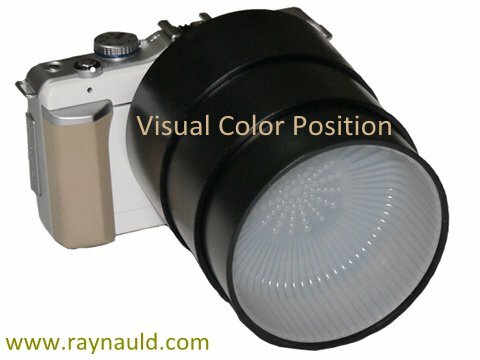 Although, there are two standard positions on “RAYNAULD™ Directivity Color Calibration Filter” to shoot either for “Absolute Color” or for “Visual Color” photo or video, it still can be used to achieve some relative adjustments to compensate the minor differences to individual camera gray card systems on the color temperature through the adjustments with black barrel and opal filter cup. Due to the physical characteristics of each camera and difference in “manual white balance” of each lenses, please use the most commonly used lens for filter color calibration purpose. After it is done and written done, you can find the relative position of other lenses. If you have several lenses and camera, it may take a few trials and comparisons to complete. The monitor color must be well calibrated before doing the “Visual Color” calibration of the camera and the filter. As to monitor calibration, we would recommend Datacolor Spider4 or any professional monitor calibration application for best results. However, there is an alternative method of comparing the digital photo and the real world by using the retina iPad for this purpose. How to conduct the photo color with environmental color for calibrating? The easiest way to do so is to shoot photo at the spot and make color comparison on the monitor or iPad immediately. We would suggest to place a few of well-familiar house hold staff and colorful clothes in the scene for easy comparison. Human vision is very sensitive towards direction as well as any reflection of objects. Thus, it would be a good idea to view the scene in the same direction as the lens was pointed to for best results. The “Visual Color” standard position, Filter Cup At The Edge as illustrated in the following picture, works well for quite a few cameras. Maybe, it is a good idea to use the photo taken in this position to calibrate your monitor until you get a professional monitor calibrate device to do so. Of course, the camera manufacturers might do some special “color enhancements” to enhance certain effects, such as the famous sky color of Olympus Camera. The camera system twist would make it impossible for DCC filter to fine tune well. On the other hand, Canon and Panasonic camera work extremely well with “Raynauld Directivity Color Calibration Filter” in both standard positions for “Absolute Color” and “Environmental Visual Color” photos and/or videos.